That’s right. Ah-mazing! So worth the trip. Obviously I had seen pictures of the ice sculptures, but seeing them in real life was something else. The area is huge and the scale of the sculptures is incredible. Check out the pictures below and you can see how tiny people are next to them. We visited the Ice and Snow World park, which I believe is the biggest and most famous one (apparently there are a few different ones). We timed our visit so that we got to see everything both in daylight and beautifully lit up in the dark – recommended! This is one of the coolest things I’ve seen in China so far (and the crowds were not bad at all!). We arrived late Friday evening and flew back home on Sunday morning. And that was enough. Sure, it would have been interesting to see more of the city, but one full day was definitely enough to see the Ice and Snow Festival plus a little more. Besides checking out the ice sculptures, we strolled around the city center for a couple of hours, and even had time to visit a Siberian Tiger Park that was surprisingly good. We expected to see one or two tired tigers, but there were literally hundreds of them running around big fields! Harbin was freezing. The temperature was around -20 Celsius, and even though we packed our warmest winter clothes and boots, we still had to buy ski-pants on the street to keep us from freezing to death. Luckily there were plenty of heated indoor areas at the ice festival park (like Pizza Hut and KFC, haha), so it was easy to pop in and warm up whenever we got concerned about losing body parts to frostbite. We stayed at the Holiday Inn in Harbin city center, and the excellent location definitely made a huge difference to our trip. It was right at the end of the most popular pedestrian street, so we had easy access to restaurants, famous sights, shopping etc. Very convenient, especially when you’re in town for a limited time. Holiday Inn’s awesome concierge hooked us up with a car and driver for almost a full day for only 300 RMB. This was quite literally a lifesaver considering the intense cold. We had no idea if it would be easy or difficult to find a taxi around the remote ice and snow festival area, and we didn’t really feel adventurous enough to find out. The car took us around town all day and waited for us until we were done with whatever we wanted to do and see. And our super friendly driver always kept the heater blasting. That’s one more destination checked off my China Bucket List, wohoo! Have a great weekend guys, and don’t forget to follow me on Instagram @shanghaistablog! One of the perks of living in China is having the 7-day Spring Festival national holiday to celebrate Chinese New Year. Everyone is off work and school, which translates into the largest human migration in the world. People pour out of big cities, and most streets, restaurants and shops become eerily quiet and deserted for one week. Locals travel back to their hometowns to spend time with their families, and most expats take the chance to travel around Asia Pacific. Robert and I originally wanted to travel to Palawan in the Philippines, but we started looking into it waaay too late and missed out on good deals and reasonable prices. We decided to push Palawan into next year’s travel calendar and go for comfy and easy beach adventures in Thailand instead. Good choice, although Thailand is maybe just a tiny bit too touristy for my taste… But whatever was lacking in authenticity, was certainly made up for in gorgeous turquoise waters, infinity pools, coconuts and mango sticky rice! We extended our 7-day national holiday to a proper 2 week beach vacay, which is pretty much the best thing you can do in the middle of a cold and grey winter, right? We stayed at the beautiful island of Koh Phangan, which is (unfortunately) mostly known for its infamous Full Moon and Half Moon Parties. But luckily there’s so much more to the island than drunken backpackers, and we headed up to the northern parts to some beautiful, more quiet beaches for a more “grown-up” holiday. We spent the first week in the north-western tip at Maehaad Beach. Now, our hotel was absolutely gorgeous in every way – huge oceanview-rooms, AMAZING pool, nice beach etc – but it had the grumpiest staff I’ve ever encountered. So much for the famous Thai hospitality! Robert and I had of course read all recent TripAdvisor reviews and knew not to expect top-notch service, but it was still bizarre. They were definitely in no way rude or making us feel uncomfortable, but just grumpy. Oh well, we had a nice stay nonetheless, it’s not like we relied on the level of service to make or break our holiday. For our second week we moved along to the north-eastern part of Koh Phangan to a little peace of heaven called Buri Rasa Village. And let me just say, wowza! So, if you imagine the grumpy staff at our first hotel, and then imagine the TOTAL opposite — that’s Buri Rasa Village. These guys were the nicest, most service-minded, yet relaxed people ever! And the hotel itself and the surrounding nature with dramatic hills, white beaches and crystal-clear turquoise waters made this place so gorgeous. We had a ridiculously nice stay at Buri Rasa, I honestly can’t recommend them enough. Last week we finally wrapped up the fall-semester at Jiaotong University. To celebrate good results and success in the final exams, me and a couple of classmates went to do some sipping, painting and relaxing at Sip ‘n Paint on Shaanxi South Road. I’ve been wanting to try Sip ‘n Paint for some time now as it’s become increasingly popular all over the world. The concept sounds so good: You spend a few hours at a nice art studio where you can let your artsy juices flowing and paint away either with or without the help of a teacher. And of course there’s wine. Not bad, right? We booked a 3-hour Friday afternoon “freestyle” session, which means painting without a teacher. The space isn’t too big, probably good for about 20 people tops, but we happened to be the only ones there so we could spread out very comfortably. The studio is cozy and bright, and really fits the purpose. It’s at a great location right behind the IAPM mall on the top floor of a classic Shanghai lane house. We could choose between painting with oil paint, watercolors, colored pencils and more. Oil paint seemed to be the most popular option, so that’s what we went for too. Painting was fun and challenging, but the hardest part by far was deciding what to paint. I hadn’t thought about it until the start of our session, and luckily there were loads of inspiration at the studio to help us get started. Books and prints were available for browsing, and works of others’ were hanging all over the walls. We spent around 30 minutes trying to come up with what to paint, which is precious time you’ll probably need for finishing your masterpiece in time. I’ll definitely be more prepared next time! The whole experience was super fun and relaxing, almost like meditating (but with wine and friends), and I definitely want to go back. If you’re the least bit interested in painting, drawing, being creative with your hands or just want to try something new, I’d very much recommend Sip ‘n Paint. And if it turns out you’re not too into the painting, you can just focus on the sipping, haha. A 3 hour Freestyle session costs 180 RMB including canvas, access to brushes, paint and everything else needed. A glass of wine is 40 RMB and a case for carrying home your painting is 30 RMB. Find more details here! The day in early March when Robert signed his new contract and our move to Shanghai was confirmed. We had a special champagne bottle saved in case life-changing events like this would occur, and that night the cork was certainly popping. Shanghai had been our “if you could choose any city in the world to live in” -place ever since we moved away from Asia the last time in 2013. You can imagine how crazy happy we were when that was suddenly becoming reality. Consequently I also became a huge believer in law of attraction! It’s been an awesome year for me travel-wise. Very hard to choose the best one, but the cake goes to the perfect Golden Week beach vacation in Phu Quoc, Vietnam with Robert. Beaching, eating, reading, exploring, drinking drip-coffee and mojitos while enjoying each other’s company in gorgeous surroundings was definitely a highlight of my year. An honorable mention goes to my spontaneous trip to New York in May to visit my parents. I had an unexpected extra couple of weeks before the move to Shanghai, so I decided to head out to the US where my parents are currently living. Just spending casual quality time with them is such a rare treat these days, so this was definitely the best bonus. Home cooked meals, watching SNL with mom and dad, shopping with mom… Perfect. To study Mandarin full-time at Shanghai Jiaotong University. Becoming awesome at Chinese has been a goal of mine for some time now, and it feels crazy cool to be able to pursue it 100%. It’s been way more intense and time-consuming than I expected, but I’m making good progress, which in turn gives me lots of energy and motivation to keep going. Final exams for the fall semester are next week, and I just signed up to keep going for at least another semester in the spring. Yikes and yay! Definitely my camera, Canon PowerShot G5X. It’s a small but powerful camera that I bring with me pretty much everywhere. I’ve gotten more and more into photography this year, and I definitely plan to keep at it in the years to come. Right now I’m considering making a GoPro the first big purchase of 2017, since so many holiday photo-ops are missed without a waterproof camera… What do you think, is it worth it? This is a really tough one, but I have to go with the Salmon Benedict on Kabb’s weekend brunch menu in Shanghai. Kabb is not a very special restaurant in general, but I just find myself craving for this amazing dish of theirs quite often. The runner up would probably be Chicken Xiaolongbao at Din Tai Fung. Yum. Hands down the fresh Passionfruit Mojito at Peppercorn Beach Resort in Phu Quoc, Vietnam. A little sweet, a little sour, so refreshing. Not the best picture of it, but you can take my word for it (the one on the right). It was heavenly. For some reason this was a really slow book year for me, but the best of the 5-6 books that I managed to read would be Stalker by Lars Kepler. Kepler’s books are always terrifying page-turners that I can only read when it’s light out, preferably in the summer time. Stalker didn’t disappoint. My maxi-dress from Marks & Spencer (on the left). This was the most comfortable summery evening dress, and one of my favorite outfits all year. I love the simple cut in a fabric and color that makes it stand out. I’ll definitely be taking it to the tailor market in spring to have it made in other colors. My hike up Victoria Peak in Hong Kong. A perfect one hour workout with a killer view. Besides that, 2016 was also the year when I discovered Zumba. I know, I’m about 10 years late, but OMG how awesome is Zumba!? The most fun workout ever! Thanks to going to Zumba every other day, my absolute favorite song of the year is La Bicicleta by Shakira and Carlos Vives. La Bicicleta always equals dancing feet and a smiley face! All in all my 2016 was a year of big changes, new beginnings, pursuing passions and traveling. The best of all was that I got to share it with the love of my life. And despite being far away from family and friends, I got to spend much more time with them than expected. Lots of feelings of gratitude here now when I think back on it all. Can’t wait to see what 2017 will bring. Happy New Year to you all! My Instagram #bestnine2016. Don’t forget to follow @shanghaistablog for more pics! Wow, I’ve been terrible with the blog lately. No excuses, just haven’t managed to prioritize writing (although I’m totally blaming school!). I’ll try to get back to it very soon, but in the mean time I just wanted to post a few snaps from my awesome neighborhood, the Former French Concession. It’s crazy that these green, peaceful streets are right in the middle of such an enormous metropolis. I love this area with all it’s small shops, amazing restaurants and cozy vibe, and right now it’s so beautiful with the yellow leaves and autumn colors. The pictures are from my daily bike route to Shanghai Jiao Tong University, mainly from Wukang Lu and Anfu Lu. Make sure to follow me @shanghaistablog on Instagram for more pics! Let’s start this new week with something a little more light-hearted, shall we? I think we all need that after the miserable political events of the last few days… So coming up today – Shanghai beauty tips! This city is packed with stores that sell beauty products from all over the world, and local salons offer every face/body/hair treatment that exists. But unfortunately China doesn’t always have the best reputation when it comes to quality, reliability and hygiene, so finding the good spots with a high enough standard is worth gold! Here are a few tried and tested favorites that I can gladly recommend to anyone in need of some beautifying. We’ve all heard the horror stories about expats going to Chinese hair salons and coming out with either no hair, burnt hair or just the worst imaginable haircut (like Robert who accidentally got the Kim Jong-Un style a few years back). I’m very protective of my hair, but the other week I gathered all my courage and made an appointment to the Franck Provost salon on Anfu Lu after hearing so many good things from a handful of reliable (=blonde) sources. And boy am I glad I did! Turns out that they do blonde highlights much, much better than I ever had done when living in Copenhagen. No burnt hair, no yellow tones. Only beautiful, soft, ashy, bright blonde. I paid around 1300 RMB for highlights + cut, so about the same as I’m used to back home. Too bad I don’t have a good before and after shot (will do next time), but in the picture below you can get a sense of the result. The salon also has such a nice, modern vibe and the staff made me feel super welcome and relaxed. I even got the membership card since I’ll definitely be going back soon, that way I’ll save around 10-15% on their services. The salon also sells imported hair-care products from big brands like Kérastase, Davines and L’oréal. Moving here to Shanghai definitely made my skin react. The pollution, humidity and lifestyle changes caused my face to freak out quite a bit, and adding any harsh products to that would have probably caused even more trouble. Luckily the beauty gods heard my prayers and guided me to try this amazing mask a few weeks back: Aloe Soothing sheet mask from Korean skin-care brand Jejuen. I absolutely love this product, it calms any ongoing irritation while providing skin with plenty of moisture, leaving my face looking super balanced and glowy. This is perfect for sensitive, combination skin like mine. So now once a week for 20 minutes I look like Freddy Krueger, scaring poor Robert and the neighbours, but it’s so worth it. Sephora is my #1 place to shop anything beauty-related, and that’s where I found these babies too. Get a pack of five for 200 RMB. Hooray for K-beauty! I’m totally hooked on the heavenly hand and body washes from Shanghai-Australian company eco&more. They smell and feel AMAZING, plus their line of products are made of safe, plant-based, hypoallergenic ingredients, which means less skin exposure to harsh or even toxic chemicals often found in personal care products. It’s obviously not the cheapest soap in the store – a hand or body wash will cost you between 60-110 RMB – but the bottles are pretty big, plus I don’t mind paying a bit extra for quality products that add some luxury to everyday life. I’ve seen eco&more products in convenience stores and supermarkets around popular expat areas (French Concession, Jing’an, Xintiandi), and also in the Fields online supermarket. You can also order products through their website here. I just found a department store that not only sells a proper bronzer, but actually my all time favorite one from Bobbi Brown! Now, some of you might not get what a huge deal this is, but for years and years all you could get in China were whitening products. Whitening body lotions, face creams, masks, foundations, powders, you name it. The beauty ideal is all about being as white and pale as possible, and products giving any bronzed, sun-kissed glow to your face or body have been veeery hard to find. Maybe buying quality bronzer in Shanghai is old news by now, who knows as I’m still a newbie in town, but I just wanted to share in case someone else is on the lookout and don’t know where to start searching. Get Bobbi Brown’s Bronzing Powders in various shades at the Isetan department store on 1038 Nanjing Xi Lu. Got any hot beauty-related tips for Shanghai? Please share in the comments! Last week China celebrated it’s annual 7-day National Holiday known as Golden Week. The country pretty much shuts down for a full week and the busy, crowded streets of China’s megacities become deserted and quiet. Most locals take the opportunity to travel to their hometowns to be with family, and most expats leave the country either to visit home or to travel around Asia-Pacific. Robert and I spent our holiday at the calm beachy island of Phu Quoc, Vietnam (checking off Vietnam on my China Bucket List, wohoo!). We stayed at the northern tip of the island at Peppercorn Beach Resort, a small boutique resort that was absolutely perfect for us in every way. A beach villa right by the ocean, turquoise warm water, kayaks and snorkels to borrow anytime, the most friendly staff and delicious home-cooked Vietnamese food… Ahh just brilliant. I haven’t felt this relaxed after a holiday for ages! There’s not much exciting stuff to report from our vacation as we spent our days lounging, reading, eating, drinking delicious Vietnamese drip-coffee, reading, swimming, reading some more, and so on. After four very hectic months with moving back to China and adapting to a new life here, I didn’t even realize how much I needed a real break. Sometimes you don’t notice it until you just stop for a moment. But thanks to Phu Quoc and Peppercorn Beach I’m back feeling invigorated and energezied, all ready for the fall! Vitamins in the kitchen! I don’t know how I’ll be able to live without this every morning. Phu Quoc produces loads of high quality pepper, so there are pepper plantations all over the island. We stopped to check out what pepper actually looks like when growing on trees. Pleco is probably the most famous and downloaded Chinese dictionary and learning tool there is. And for a good reason – it’s just awesome! This is also by far the app that I use most both in daily life running around Shanghai, and when studying Mandarin. The dictionary is obviously extremely useful (and free! ), but if you’re studying Chinese I would highly recommend buying the Flash Card system that’s available as an in-app purchase. It allows you to create your own categories and study the flash cards in whichever way you want (character – pinyin, pinyin – English, English – character etc.). At least for me this is probably the most effective way of learning characters, as it’s something that requires endless repetition. It’s perfect to do at home, on the metro, while waiting for a friend, or just whenever you have a few minutes to spare. The Flash Cards also come with ready made categories based on HSK levels, which is brilliant for studying for a specific level. This week I discovered a crazy cool feature in Pleco which I have completely missed before. I’m sure this is old news to everyone else, but just in case, here it is: If you add the keyboard for Simplified Chinese in your smartphone settings, make sure to pick the one for Handwriting as well. Now go to the dictionary in Pleco with the Handwriting keyboard active, and instead of typing in English or pinyin in the search field, you will be able to draw the character and Pleco gives you the definition. AMAZING! This is SO useful and fast when you encounter characters you don’t recognise, which happens all the time here (at restaurants, on websites, in the bank, etc etc…). Thanks Lisa in 阅读课 for revolutionising my Chinese learning yet again! Number two on my list has to be Bon App. This is the best app for local restaurant search, ratings and reviews in Shanghai. You have plenty of options for searching and filtering, like by area, name and/or cuisine. You can even filter by happy hour and ladies night, yay! Bon App also has the Near Me feature, which makes it super easy to spot a good place in your proximity. Registration is not needed for searching and browsing venues and reading reviews, but those who want to contribute with likes/dislikes and comments do have to create a simple profile. Bon App is a bilingual platform, so it works both in English and Chinese. I don’t see how one survives in Shanghai (or anywhere in China) these days without WeChat. Messaging and calling is done mainly through WeChat. People don’t exchange phone numbers or e-mail addresses anymore (and forget about Facebook for sure), it’s all on WeChat. WeChat is also the most important customer facing platform for most businesses. Many companies invest in sites within WeChat instead of producing separate apps, as it’s very easy to integrate to the user-friendly platform that everyone here prefers using anyway. But as I’ve mentioned before, if you’re not fluent in Chinese, utilizing WeChat to it’s max is difficult. I mainly use WeChat for communicating with friends, to pay bills, and to stay updated with my favorite local businesses and communities. Btw, check out Baopals’ WeChat page for shopping on TaoBao and Tmall in English! It’s a brilliant site, Baopals can access the entire inventory on TaoBao and Tmall with their English interface, so finally we foreigners can shop away even with limited Chinese skills. I just tried it last week to order a water dispenser – worked like a charm. Woop woop! Dianping is probably the most extensive directory of businesses in Shanghai. It’s great for finding stuff like dry cleaners, banks or tailors that probably won’t be marked in Google or Apple Maps. Just search with a name or keyword in the app’s search field and get dozens of choices with ratings sorted by proximity. There’s one little issue worth mentioning though – it’s all in Chinese. But don’t let this scare you even if your Mandarin isn’t so hot. You can still search with well-known names and brands (like ‘Sephora’ as in the picture below) and just by testing it out and clicking around you can gather plenty of info without actually reading one single character (like clicking on the address which takes you to an interactive map). And when you’re feeling like experimenting more (aka. when you’re desperate), start out with using Pleco for translating, then copy-paste the characters into Dianping (like I did to find my shoe repair guy). 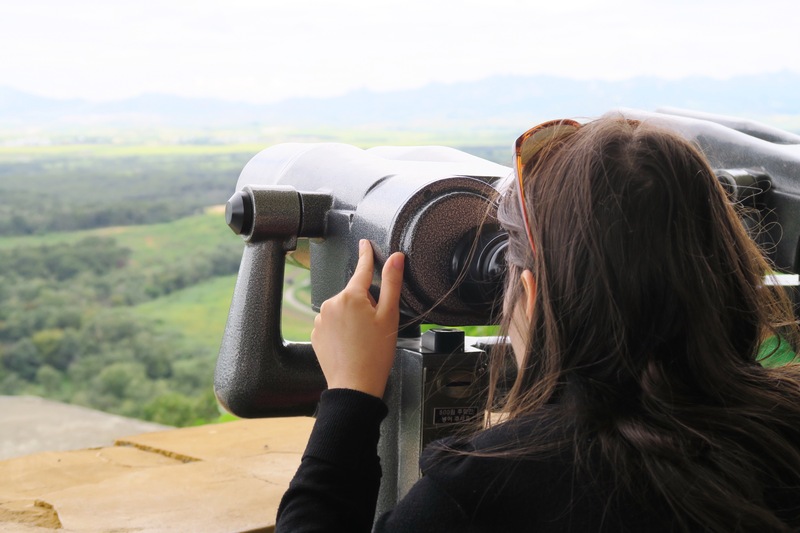 Check out the places close to you with the best ratings and enjoy that awesome feeling of cultural-barrier-breaking accomplishment when you finally find what you’re looking for. I’m still mourning the fact that I now have very limited access to streaming HBO, Netflix and YouTube, but luckily Youku and iQiYi offer some comfort. These two Chinese apps have quite a good selection of international movies and TV series, and streaming is smooth as silk as they are hosted by local servers. The interface is fully in Chinese (most movies’ and TV series’ titles included), but try it out and click around and you’ll eventually find the section for international entertainment. Start by looking for 电视剧 (TV shows) or 电影 (Movies) in the top menu, and follow by looking for 美国 / 美剧(USA) or 英国 / 英剧 (GB). Other apps worth mentioning are definitely Smart Shanghai and Explore Shanghai Metro Map. SmartShanghai has a great directory, plus articles and tips on what to do and where to go every week. Explore Shanghai Metro Map is an app for figuring out the metro system, which you’ll need it sooner or later, trust me. And of course there are the real lifesavers, the VPN apps. Express VPN and Astrill are the top paid ones, and then we have Betternet that works as a pretty good free back-up. There’s also an app on my list that I recently downloaded but haven’t had a chance to try yet: BottlesXO. BottlesXO offer quality imported wines for reasonable prices – and here comes the best part – with home delivery within an hour. How brilliant is that! And of course whites and roses come properly chilled. So no need to panic when you’re having a party but running out of wine, just get BottlesXO to the rescue! Perfect. Robert and I lived in Beijing a few years ago, and we absolutely loved our home back there. We had the best location, new building, bright modern apartment, 30th floor and the most spectacular view. It was just perfect. So when we came to Shanghai, the part of China that’s much more modern and international with higher standards, we obviously had even higher expectations. With a decent housing budget in our back pocket we assumed that apartment hunting would be like cherry picking, mainly made difficult by having to choose the best out of endless amazing options. Well, that wasn’t quite the case. We were hoping to find a nice, modern, bright 2-3 bedroom apartment with a great, central location, but we quickly learned that this was a difficult equation even for a generous budget. If we wanted the location, we would have to compromise significantly in size and quality. And yes, we wanted the location, that was definitely a priority. The Former French Concession around Huaihai Lu/IAPM Mall was at the top of our list, but we we’re also considering the Xintiandi area. Both are very popular and sought after both by expats and locals, which means prices are crazy and you don’t get too much for your money. But what surprised me most was how run down many of the apartment buildings were, both inside and out. We were mainly looking at newer, 5-20 year old high-rises and compounds (not lane-houses), but even they looked old and tired. If we wanted sparkly and new, it would have to be in another area. We decided to be open and flexible on the degree of fanciness and prioritise finding a place in the part of the city that we wanted to be in. Good move, because in the end we eventually found something not at all too shabby! Unless you have a gigantic housing budget, be prepared to compromise on your requirements. Robert and I went in to this having the longest list of wishes (rooftop pool included), but got a harsh push back to earth as soon as we were presented with our actual options. We had to completely reset our thinking and start over with prioritising as clearly as possible what we absolutely didn’t want to live without, and what we could be flexible on. Our top requirements ended up being location, functionality and a fresh, modern feel to the apartment. We also moved here with all of our stuff, so a big enough non-furnished flat with some extra storage space was pretty important. Most expats move in to fully furnished apartments, but as Robert and I don’t have a defined home to return to after the assignment, bringing everything with us, including furniture, was the best option. I’m sure it’s possible to find an apartment and make a lease contract all by oneself here in Shanghai, but I think most of us expats are definitely better off with an agent. Negotiating terms with the language barriers and cultural differences, ugh. And even finding properties to visit in the first place… Better leave it to the pros. But finding a good foreigner-friendly agent can also be difficult as expats and locals often have very different standards and taste. The safest bet is usually asking for recommendations in the expat community, preferably by someone with a similar budget and situation as you. So what kind of apartment did we find, where have we moved in to? We ended up getting super lucky and finding a beautiful 3 bedroom flat in an excellent location on Changle Lu in the heart of the Former French Concession. The building is a bit run down and doesn’t look too impressive from the outside, but the apartment itself has just undergone renovation and everything inside is brand spanking new. Even our storage problem is solved as we pretty much turned one of the bedrooms into a huge closet. Yay! I’ll post more pictures once the place is more decorated, but for now I’ll leave you with these snaps from the apartment viewing and moving day. Hello dear friends, I’m back from radio silence! It’s been a bit hectic for the last couple of weeks, especially since we’re in the middle of finally moving in to our new apartment, yay! We also went on a quick two and a half day trip to Seoul last week. Robert had to go for business and luckily I was able to tag along, and we even had a full day together for some touristy stuff. This was my second time in Seoul so I didn’t plan too many activities for myself. I was really looking forward to just walk around and feel the vibe of the city, and hang out with my lovely Korean girlfriends who I met during my summer Chinese course at Jiao Tong University. But as mentioned, Robert and I had a day to do something interesting and different. 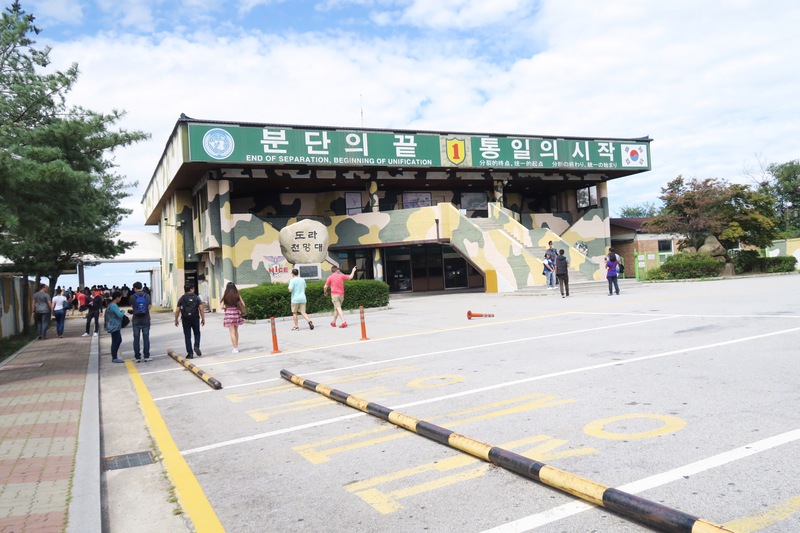 We were discussing and researching quite a bit whether or not it would be worth to visit the Demilitarised Zone, or the DMZ, which is the neutral area between the South and North Korean borders. It’s pretty crazy how close North Korea is to Seoul. 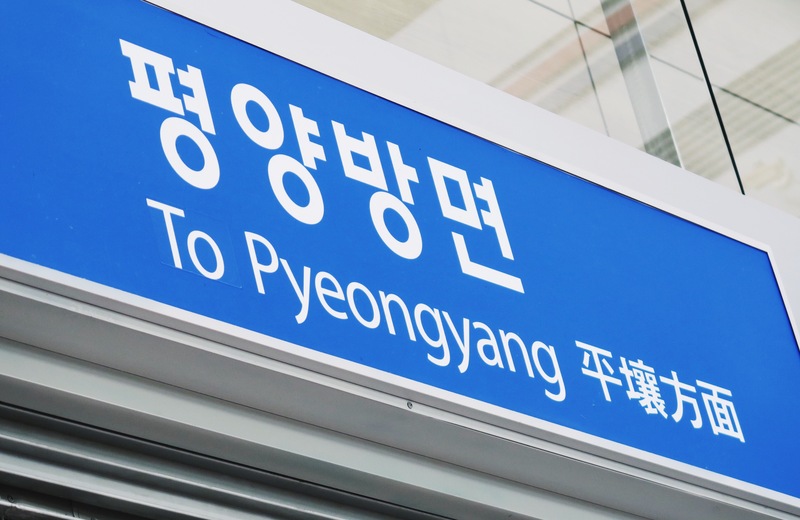 You really don’t think about it (at least as a visitor) when spending time in a super modern and international city like Seoul. But there it is, only an hour away by car. 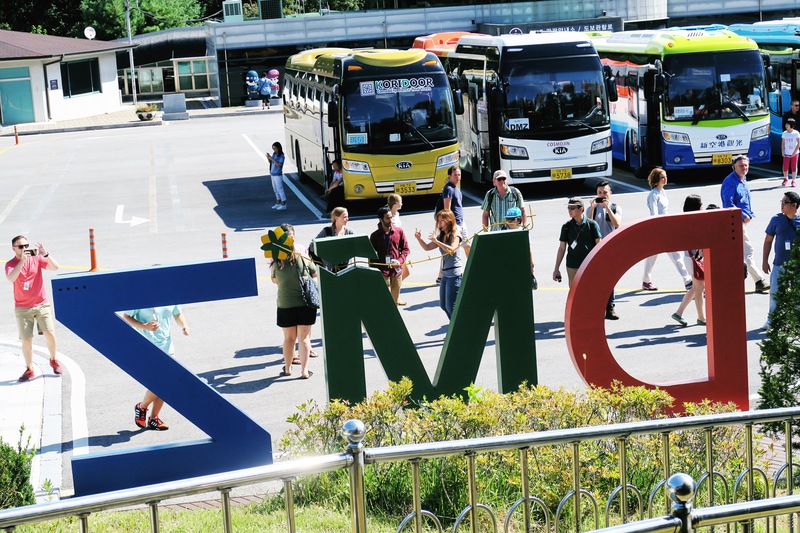 Some TripAdvisor reviews claimed that the DMZ is a huge disappointment and visiting is a waste of time, others were extremely positive describing the place as an absolute must-see. 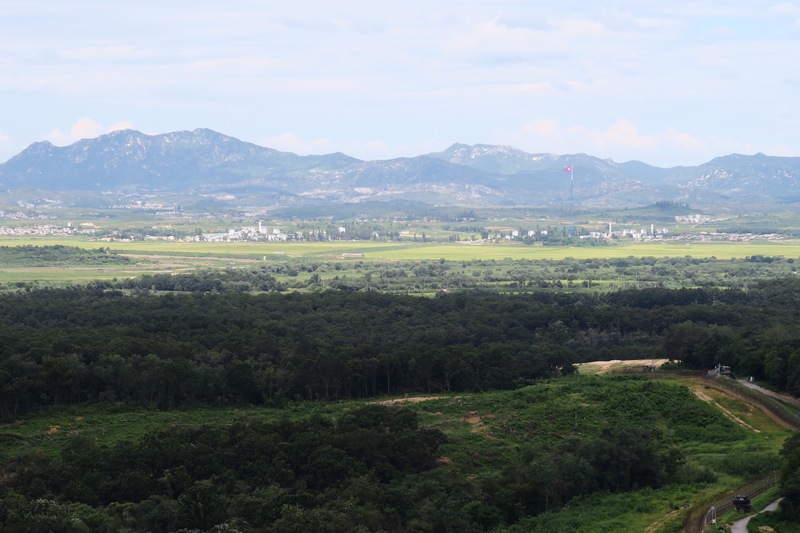 We kept going back and forth, but when we thought about the fact that we would actually be able to look in to North Korea, this extreme, controversial country that is so mysterious and closed, we just knew we had to book the tour. And I’m so glad we did. The negative reviews were right in the sense that there really wasn’t that much to see, but the super bizarre atmosphere of the place definitely made up for it. 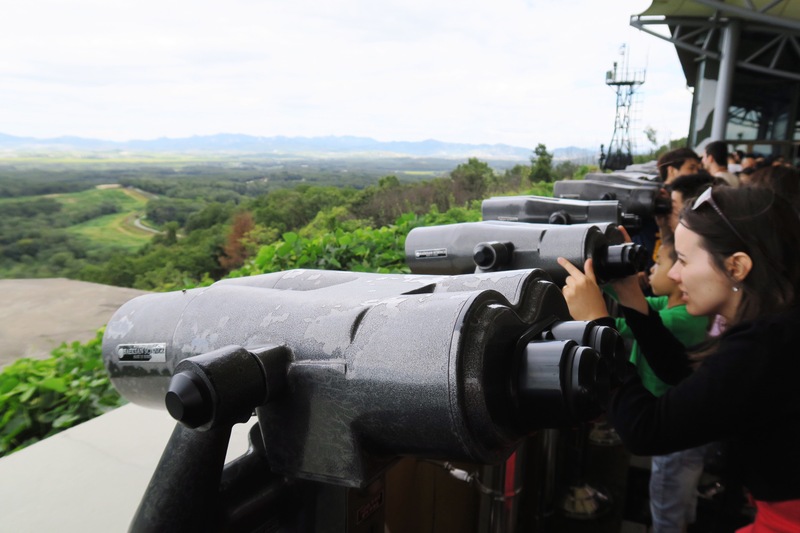 The tour took us to three areas in the DMZ: a secret tunnel that the North Koreans built to invade South Korea, a modern train station that has a track to Pyeongyang but is currently not in use, and an observatory from where you can look over the DMZ and in to North Korea. Out of the three, the observatory was by far the most exciting. You could only see fields, mountains and the so called propaganda village (an attempt by North Koreans to convince outsiders of how nice and prosperous their country is), but it was easy to spot small details immediately giving away that something just isn’t right on the other side. 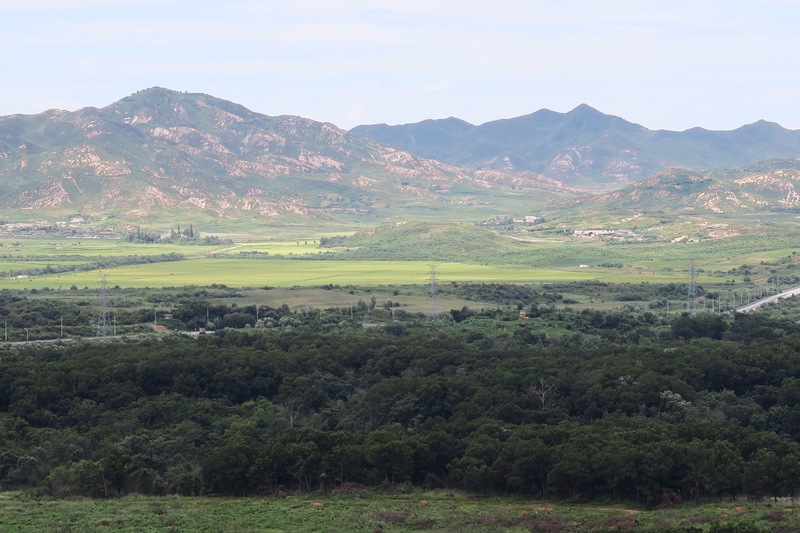 For example, there are barely any trees left on the North Korean side, yet the DMZ and the South Korean side is filled with them. Why? Most trees have been cut down for heating and light due to the lack of electricity. In addition to the unique, almost freaky vibe, our tour was made very good by our tour guide, Hana. She covered a lot of super interesting Korean history and gave us great insight on how everyday life is when North Korea is your neighbour. Very fascinating stuff. All in all I’m extremely happy that we went on the tour and I would absolutely recommend it to others. But I can also understand that someone who isn’t very interested in the topic might find the place boring and disappointing. We booked with Seoul City Tour, which came recommended on TripAdvisor. They definitely get a 5 star recommendation from me too.